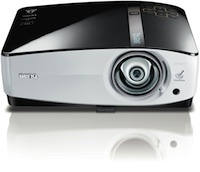 BenQ introduced a new 3D-ready projector at the InfoComm 2010 conference last week in Las Vegas. The new MP780 ST is a short-throw DLP projector that offers interactivity similar to an interactive whiteboard. The projector takes advantage of a DrawPoint pen that can be used on most surfaces to draw on the projected image, without the need for additional hardware. With a throw ratio of 0.5:1, the unit can produce a 95-inch image at a distance of slightly more than 3 feet. Inputs include an HDMI 1.3, RGB (mini D-sub 15-pin), and S-video, along with a 3.5 mm stereo minijack, USB display port, and USB reader port.